Harry Hopkins was born in Sioux City, Iowa, the fourth child of David Aldona and Anna Pickett Hopkins. Hopkins attended Grinnell College and soon after his graduation in 1912, he took a job with Christodora House, a social settlement in New York City's Lower East Side ghetto. In the spring of 1913 he accepted a position with the New York Association for Improving the Condition of the Poor (AICP) as "friendly visitor" and superintendent of the Employment Bureau. In October 1913, Harry Hopkins married Ethel Gross and the couple eventually had three sons: David (1914-1980), Robert (1921-) and Stephen (1925-1944). In 1915, New York City Mayor John Purroy Mitchel appointed Hopkins executive secretary of the Bureau of Child Welfare, which administered pensions to mothers with dependent children. With America's entrance into World War I, Hopkins moved his family to New Orleans where he worked for the American Red Cross as director of Civilian Relief, Gulf Division. Eventually, the Gulf Division of the Red Cross merged with the Southwestern Division and Hopkins, headquartered now in Atlanta, was appointed general manager in 1921. Hopkins helped draft a charter for the American Association of Social Workers (AASW) and was elected its president in 1923. In 1922, Hopkins returned to New York City where he became general director of the New York Tuberculosis Association. During his tenure there, the agency grew enormously and absorbed the New York Heart Association. When the Great Depression hit, New York State Governor Franklin Roosevelt called on Hopkins to run the first state relief organization in the nation – the Temporary Emergency Relief Administration (TERA). Hopkins met Eleanor Roosevelt only after he had accepted the job as head of the TERA. She reported, "I never heard of Mr. Hopkins until long after he had been working for my husband in New York State, so that whole paragraph on my having discovered him is untrue. "(1) In Albany, Hopkins and ER began an enduring friendship, which had significant impact on New Deal policy. Soon after Roosevelt's inauguration as president in 1933, he summoned Hopkins to Washington as federal relief administrator. 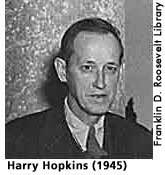 Convinced that work should be the chief antidote to poverty, Hopkins used his influence with FDR to push for federal programs to provide government-sponsored jobs for the unemployed. Reinforced by ER and Lorena Hickok's reports from the field, Hopkins worked to alleviate the suffering of the unemployed by creating work and relief programs for the unemployed. His particular contributions to the New Deal included the Federal Emergency Relief Administration (FERA), the Civil Works Administration (CWA), and the Works Progress Administration (WPA). He supported ER's call for a National Youth Administration and the Federal One Programs, and the two worked closely together to promote and defend New Deal relief programs. During the war years, Hopkins acted as FDR's unofficial emissary to Winston Churchill and Joseph Stalin, as administrator of Lend-Lease, and as the shadowy figure behind Roosevelt at the Big Three conferences. Hopkins died in early 1946, succumbing to a long and debilitating illness. Eleanor Roosevelt to Drew Pearson, August 14, 1943, Hopkins I, 19:1, Georgetown University Lauinger Library, Special Collections, Washington, D.C.
Hopkins, June. Harry Hopkins: Sudden Hero, Brash Reformer. New York: St. Martin's Press, 1999. passim. McJimsey, George. Harry Hopkins: Ally of the Poor, Defender of Democracy. Cambridge: Harvard University Press, 1987. passim. Sherwood, Robert. Roosevelt and Hopkins: An Intimate History. New York: Random House, 1948. passim.